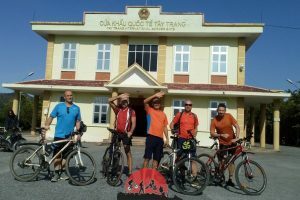 Chieng Mai Biking To Luang Prabang and Hanoi .Connecting the two magical cities of Chiang Mai and Luang Prabang, Hanoi this journey starts in the northern part of Thailand, a mountainous region bordering Burma and Laos, punctuated by the mighty Mekong River. The area has been baptised the “Golden Triangle” with a history as colourful as the people that inhabit it. Cycling though the Northern of Vietnam to Sapa beautiful mountain to Hanoi Capital . Thailand’s northern city of Chiang Mai is the starting point of this adventurous tour. The tour starts leisurely with a ride along the Ping River and heads to the handicraft centre at Ban Tawai for some shopping. Cycling on back roads through many small villages you’ll see how the locals live and work. The afternoon ride is one of the most scenic on the trip and a real pleasure to cycle. The day is topped of with a stay at a beautiful resort with a splendid view of the Mae Kok River. Ride straight from the resort to a Jakhu village before hopping onto a boat for a leisurely cruise down the Mae Kok river. 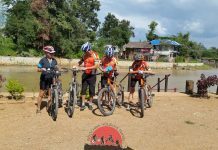 The afternoon riding is off road, with beautiful views of the river, before the surface switches to tarmac for our final push into Chiang Rai. 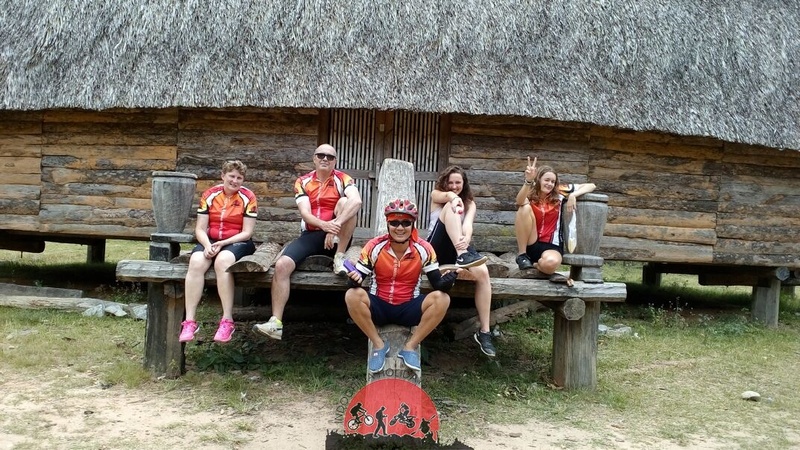 Though today’s riding is picturesque, through rice fields dotted with limestone karst mountains, on good road surfaces, the highlight will be the lovely lodge we’ll spend the night at. Set right in the middle of a Hmong village you’ll be able to mingle with villagers and have tea with the shaman. Today we leave Thailand behind, cross to Laos and spend our day relaxing on the Mekong River. We have a private boat so we can stop when we want to visit some riverside villages along the way. 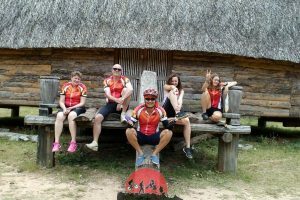 Be prepared for an epic day of challenging riding on a broken track along the Beng river, through pretty Lao villages and unforgettable mountain and jungle scenery. Cycling through rural Laos, you’ll have to make way for all types of colourful vehicles and livestock. We are now in the central highlands, and there are some spectacular views across the rugged mountain landscape. We cycle through Hmong villages few people will ever visit and through some of the region’s last remaining rainforest. A day to relax those overworked legs and enjoy the balcony of your riverside room or take a leisurely stroll around the small rustic town of Nong Kiau. A river journey between limestone cliffs on the Nam Ou river starts the day. Disembark at Pak Ou and visit the famous caves which are crammed with sacred Buddha images. Time to get back on the bicycles and a scenic ride to oneof Asia’s most picturesque towns, Luang Prabang. Visit Vat Visoun, the site of an impressive stupa, That Makmo, stylistically more Srilankalese than Lao. Then walk to the nearby Vat Aham, which is one of the city’s major tutelary shrines. Climb Vat Phousi hill for an outstanding view over the city. Continue to visit Vat Sene and Vat Xieng Thong, considered as the most beautiful temple. Next, drive to visit Ban Phanom, a weaving village populated by Thai Lu. After lunch at Un Petit Nid Restaurant, visit the National Museum (former King’s Palace) displaying a collection of personal artifacts of the Royal Family. Lunch at the restaunrant , Then stroll through the lively Central Market where the ethnic minorities of the surroundings come daily to trade their goods. Drive to Ban Xang Khong village to see how traditional Sa paper is made. View the sunset from the banks of the Mekong River. Afternoon An easy ride to the scenic Kuang Si Waterfalls along ethnic villages such as Hmong an Khmu. Enjoy a swim in the clear water basins of the Kuang Si Waterfalls .Transfer bacck to Luang Prabang . Today is the longest and the most rewarding day of cycling, we will be treated to our first glimpse of karst rock formations rising boldly out of the landscape. We will be riding on good, mainly flat roads. After 82km you can choose to take a boat into Pak Mong, stopping to visit the holy caves of Pak Ou, (optional extra) or cycle all the way to beautiful Pak Mong encircled by mountains and situated on the banks of the Mekong where it meets the Nam Khan River the peaceful surroundings and the people. 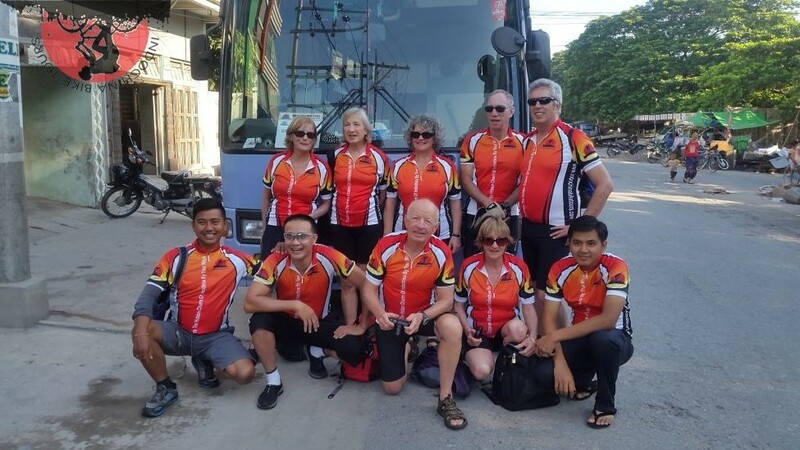 This morning the bikes 30km and will be transferred to Nong Khaiaw whilst we take a glorious boat trip along the Nam Ou river. The scenery is breathtaking as we journey past mountains and caves and cycling to Muong Khoa . Continuing on the dirt road, you will cross the border to Vietnam. After the border crossing, asphalt is coming back and it goes mostly downhill, before you will arrive in the valley of Dien Bien Phu. The city is well known throughout the world as a battle field in the first Indochina War, where the French found their Waterloo. The city is located in the Muong Thanh Valley, famous for its tasty rice and Thai minority traditional dance. Cycling to visit War Museum . Dinner in resort . 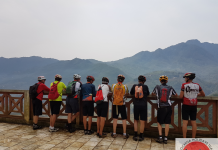 After breakfast we will start to visit French Blockhoude , Take a brutal ride this day to Old Lai Chau and get a reward of truly spectacular views. 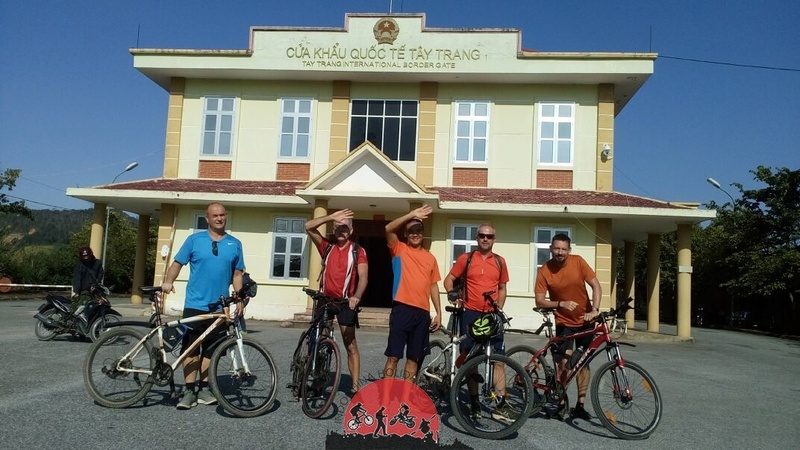 On the way we will have interesting stops to visit H’mong and Dzao villages.The ride is on the main road, uphill and tarmac downhill, mixed of gravel and hard pack clay. Visit some minority people on the way . Overnight in Muong Lay . Accommodation: Hoa Binh Hotel . After breakfast we will start long day cycling along the river. On the way we will have interesting stops to visit H’mong and Dzao villages. Lunch on the way . 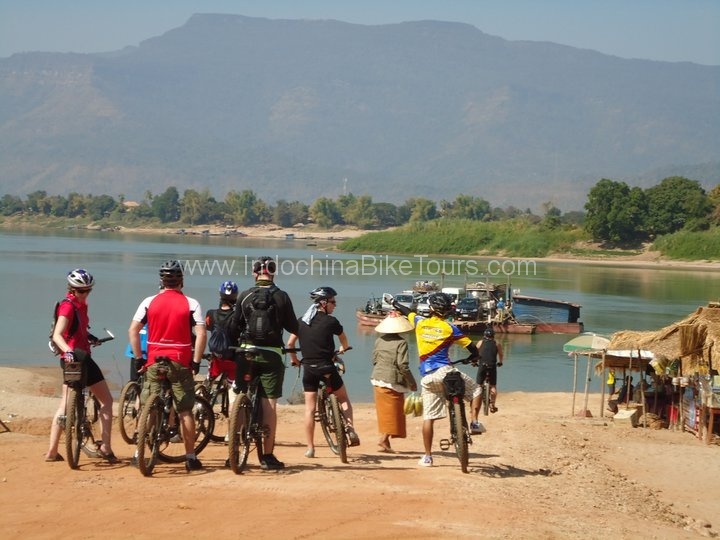 ride along stunning gorges and Nam Na River. On the way we will have interesting stops to visit H’mong and Dzao villages. Lunch on the way . We would reach Lai Chau around 5.00 pm. Dinner and overnight in hotel in Hotel . The ride today is the highlight of the whole trip. Climbing the highest pass in Vietnam, the Tram Ton Pass. Lunch in local restaurant en route. We will reach Sapa in the noon time. Sapa is the former hill station for the French colonists hundred years ago. Today Sapa is the paradise for trekking lovers thank to its beautiful trekking routes, stunning terraces, colorful minority groups and the highest mountain in Indochina, the Mt. Fansipang. and overnight in Sapa. Note: The weekend market (Sunday market) in Tam Duong is very interesting with lots of colorful ethnic minorities. If this day is Sunday the market will be included in the program and we would reach Sapa around 3pm. Breakfast in the hotel. 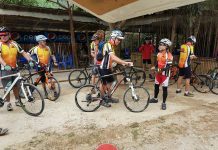 We will ride downhill to Muong Hoa valley ( Lao Chai and Ta Van villages ) . Today we enjoy the most beautiful route in Vietnam. 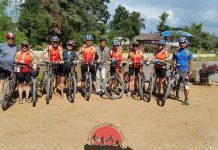 We will cycling on dirt path through pine forest, terraces and H’mong villages. En route we stop to visit minority villages, schools and we cycling back to Sapa. Lunch and Dinner free to explore local restaurant in Sapa .